The 100% of the beaches of Messinia have an excellent water quality, according to the data submitted by Greece to the European Environment Agency (EEA). These evidences show that Messinia is an ideal tourist destination with its spotless and pure beaches to meet the expectations of the visitors. The classification of the bathing water quality in four categories (‘excellent’, ‘good’, ‘satisfactory’ and ‘poor’). In Messinia, 50 beaches were tested ; all of them had an excellent water quality and they are awarded with the European Blue Flag. Kalamata is a modern city with a good layout and with remarkable financial, intellectual and cultural activity. Preserved neoclassical squares, green spaces and a beautiful coastline with wide sandy beaches and bustling cafes – restaurants make up the glamorous image of this city. It has a lively nightlife during both winter and summer, during the winter at various bars and taverns in the historic centre and during the summer in clubs and beach bars by the sea. The city has fully equipped and modern sport facilities, where everyone can take part. Also, it has a new, modern hospital as well as an international airport. The church of the Holy Apostles, the city’s symbol, it is a small Byzantine church since the 11th century, with some frescoes of the 14th century. Also, the Frankish Castle offers a panoramic view of the city. The railway park is located in the south of the city centre and it’s an outdoor railway museum, the largest in Greece and awarded by the European Commission. The Military Museum of Kalamata hosts weapons and Greek military uniforms in different historical periods. The Folklore Museum of Kalamata, hosts exhibits that have to do with the traditional arts of the region, with old and non-utilitarian objects, tools and traditional costumes. In the city is located also the Municipal Art Gallery and the Gallery of the Modern Greek Art with more than 500 exhibits. The Public Library of the city has been operating since 1933 and currently has over 90. 000 volumes books, 60.000 journal issues and an archive of more than 100.000 Messinian newspapers from the 19th century until today. One of the gifts of Kalamata is its wonderful beach where one can go walking just a few minutes from the city centre. The long beach with the exotic palm trees and the colourful umbrellas along the Navarino Avenue is not only one of the most beautiful places to be in Kalamata, but also a great choice for sunbathing. Kardamyli is located 35km away from Kalamata, the capital of the County of Messinia. It’s a coastal town and the centre of western Mani. It’s a historic place with the well-preserved old town of Kardamyli and its main towers, dated from the 15th century. Despite the development of tourism in the 80s with the Italian and Austrian tourists visiting the only camping site in the area, today the town accepts thousands of visitors every year and offers a sufficient number of beds in hotels and guesthouses of all categories. The settlement of the new town is a lively and crowded resort during the summer, with old houses and unique natural beauty. Totally green hillsides and pebble beaches surround it and, fortunately, the tourism development of the region has not changed the unique landscape. Kardamyli is also famous for the good food with fresh local ingredients that someone can find at the many taverns and restaurants which are located along the main road and next to its best beaches. Kardamyli is an ideal destination for romantic weekends, youth holidays, family holidays, and alternative tourism: in Kardamyli will not be bored whatever your preferences are. The walk through the narrow streets of the Old and the New Kardamyli is really fascinating, among the old houses and the even older towers which will bring you back in time and will tell the long history of the place. The crystal clear waters of Kardamyli are extremely clean, warm and inviting, creating a pleasant environment to swim wherever you are. No sewage waste is released into the surrounding sea and the beaches are generally very clean. There are several beaches for every taste, whether you want to be through the crowd, or if you prefer a calm lonely swimming. The forms of the beach vary from fine gravel, pebbles, stones, sand and there are many hidden bays along the coast, so a day at the beach can be an exciting adventure in the sea world. The younger will enjoy the atmosphere and the hip bars of the town, while in the nearby Stoupa you can only go if you are looking for intense rhythms. Ritsa is the closest and most beloved beach in Kardamyli. It is at the northern part of the town and is organized with umbrellas and sun beds. This beach has little white pebbles, crystal blue waters and breathtaking view of the impressive mountain of Taygetus. In some parts of the beach, there is a cool shadow of the beautiful olive trees and also there are many taverns with fresh, local food. Kalamitsi is next to Kardamyli, surrounded by high cypress trees. The beach has thin pebbles and shallow crystal clear waters, ideal for kids. Beach with pebbles and deep waters. On the beach there is a canteen for delicious hot dogs and Greek ‘’souvlaki’’ and the attraction is the characteristic rock which you can climb and enjoy some cool dives into the blue sea. Stoupa is a wonderful and really famous beach with golden sand, clear turquoise waters, countless umbrellas and sun beds, and people who come and go unstoppable. Next to the sea work many restaurants, taverns, beach bars and shops for every need. 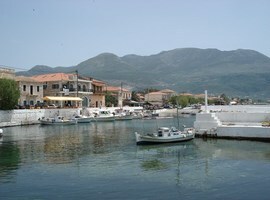 Stoupa perhaps is the best known and most tourist village of Kardamyli with visitors from April to October. It offers a large number of rooms which are usually booked from families and couples from the central and northern Europe. 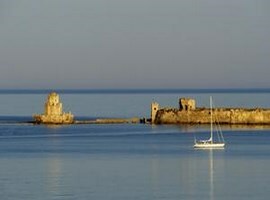 Methoni is a beautiful picturesque town at the northwestern part of Messinia. Its medieval castle with the high walls and the famous octagon-shaped fortress, built at the end of the peninsula, impressing the visitors. Except the stunning castle, Methoni is famous for its delicious and fresh food in the seaside taverns next to the sea wave and also for the beautiful beaches. The gorgeous landscape is completed by the picturesque two-floor homes with the colourful and full of flowers balconies. In Methoni, you can enjoy the view of the stunning sunset while the landscape changes when starts to get dark and the castle is lit. The walking on the beach and under the high and lit walls of the castle is something that you must not lose. In Methoni, each one of the beaches has its unique colour, its own picturesqueness and its own character. However, all of them are wonderful. This beach attracts hundreds of tourists every year as it’s very large, beautiful and organized. Here you can swim in the crystal blue waters, to enjoy the sun and the water sport activities. Above the beach work schools for water sports, camping sites, taverns and coffee shops. Lampes is separated in two parts; the first is a beach paved with white pebbles and is an isolated beach for those who want to enjoy a relaxing sunbathing. The second part is a popular beach, with golden sand and clear waters. 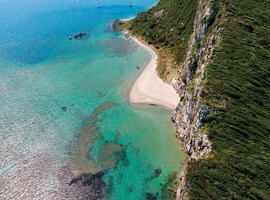 Foinikounta is a beautiful and a relaxing tourist resort of Messinia, built exactly behind from a large sandy beach. 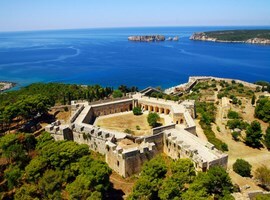 It is in the middle of the road between the castle-towns of Methoni and Koroni. During the day, the visitors can spend relaxing moments enjoying sunbathing while on the beach are located plenty of taverns, ouzo bars, and coffee shops for all the styles. In the area of Foinikounta, there are many, large and organized camping sites. If you prefer the comfortable solution of a hotel or a room to let, you can find here good facilities in good prices. Foinikounta with its beautiful and unique beaches with the crystal clear waters, the endless natural beauty, and the excellent tourist infrastructure, is undoubtedly a magical place which promises to give great emotions to those who decide to visit it. Foinikounta is not a cosmopolitan resort but a place for relaxing holidays. However, in the night you can find 2-3 bars with excellent music choices. There is also a nightclub for intense rhythms and a classic discotheque with the classic stage and a trunk of an olive tree for the bar! The music choices are mainly from the classic disco repertoire and might nice music of reggae or rock style. In the centre of Foinikounta, you will find the beach of the village, which is almost always very crowded. Beautiful golden sand and deep blue waters are the reasons that make the people to prefer it. The beach is located next to the centre of the village, so there are plenty of cafes and restaurants to sit in front of the wonderful sea. Koroni is doubtless one of the most beautiful towns in the County of Messinia, built amphitheatrically on the hillside which is located the impressive Venetian castle. Reaching to Koroni, you can admire the view of the picturesque town with the traditional two-floor homes and the well-preserved castle with the high walls, the tower and the big gate. In Koroni, you have two choices. Either you will choose to go straight to the seaside with the taverns and the coffee shops or you will choose to walk across the narrow paved streets to the gate of the castle. Just get inside the castle and walk there that the Turks, Venetians, Greeks and Franks gave Homeric battles to keep the control of the town with the great strategic importance during the centuries. 150m away from the central gate, there is a Byzantine church of Saint Sophia since the 12th century! The view from the church to the Messinian Gulf is simply irresistible while from the back side you can see the little port of Koroni and the large beach. Similar to the beach of Lampes in Kardamyli, Koroni beach is separated in two parts. At the right part, the beach is sandy with shallow waters and a beach bar full of young people and the left part is with white pebbles, waters which are getting deeper quickly and if you have with you a mask and goggles you can see while you swim some of the remains of the legendary castle of Koroni. The seaside taverns and cafes have a wonderful view of the opposite side of the Messinian Gulf and of the impressive mass of the Taygetus Mountain. Kyparissia is a coastal town in the south-western part of the Peloponnese. It’s an agricultural and commercial centre. It is separated in the old Upper Town, which is a conservation village and the New (or Down) City, more recently built that reaches the coast with an excellent layout. 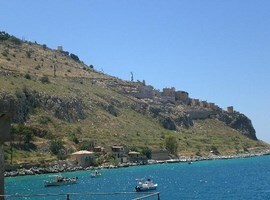 The Upper Town is situated at the foot of a small hill, on top of which are the ruins of a Venetian castle. The castle was built in the prehistoric era and that’s because of its position were too much intervention, particularly during the Venetian era. During the Turkish occupation, was the forefront of the revolution of the people against the conquerors. The area of ​​Kyparissia is rich in vegetation and has endless sandy beaches, where even today, the rare and protected turtles caretta-caretta choose to build their nests. It has all the comforts of a modern city, and a complete transportation coverage. The most popular of the beaches in Kyparissia is the beach of Kalo Nero. It’s an extremely large golden sand beach, where you can enjoy the sunbathing, the watersports and when you will get hungry to enjoy a fresh fish in the local taverns. 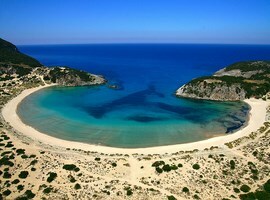 Some other beautiful beaches are the beaches of Kartelas, Seryani, Terpsithea, and Yannitsena.